Let’s talk about The Girl at Midnight! I’m trying out a new style of discussion questions, so please let me know what you think! Feel free to go beyond the questions and add any of your thoughts, or a link to a review if you have written one. And as always please turn on notifications to see the other comments and replies to yours. 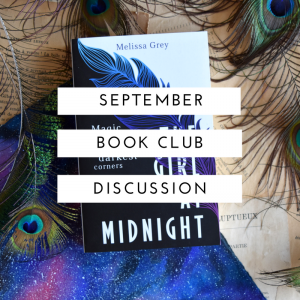 *Warning* The discussion below will contain spoilers for The Girl at Midnight (Book 1). If you haven’t read it yet you can check out my spoiler free review here! How did you experience the book? Were you engaged immediately, or did it take you a while to get into it? How did you feel reading it—amused, sad, disturbed, confused, bored…? Did you think the plot was well developed and believable? Did plot events unfold naturally? Did you have a favourite quote that you liked best? What made it stand out? Did you find the ending satisfying? If so, why? If not, why not…and how would you change it? And will you be continuing with the series? Next month we will be reading Charles Dickens’ novel Oliver Twist, if you will be joining us don’t forget to use #babblingbookclub on your photos for your chance to be featured. We will also be collaborating with a group of Bookstagrammers for the discussions, which will take place here and on instagram, so use and check the tag #EekHouseBuddiesWithATwist for details! 4. But after that great start I found the pacing really challenging. The time frame for all the action was just way too short to have any emotional impact. I mean, by the time they are all at Jasper’s place and he is making eyes at Dorian the following had happened to the people in the room in the last 24 hours: One is a ruler who has been dethroned by his sister, one is responsible for kidnapping one of the others and then abusing her, the abused one just watched a friend die, and the last member of the gang had been imprisoned by the ruler only to be set free. And yet they are making nice with eachother. The animosity, which I think is actually justified given how they have treated eachother just instantly dissipates after one conversation. I could buy this oddball gang coming to understand that they are really all on the same side after some tension, but it felt like the author really wanted to write the cute gang dynamic but didn’t quite know how to get them to that point. I can’t wait to hear what you all thought, feel free to make your own comments, reply to mine etc. But remember to turn on email notifications so you don’t miss replies. I completely agree with the rushed cute-gang dynamics. If we had had more time to process the development in their attitudes towards each other, it would have been a whole different thing. Avicen and Drakharin have been at war for centuries, but there they are, hanging out together. While it took Ivy a little longer to tolerate Dorian, it wasn’t because she had been told all her life that Drakharin were evil, but because he hit her – which is also a very valid reason not to trust someone – but it didn’t help me to sense all that war-like feelings that should have been there. I am 100% with you, I was glad Ivy wasn’t immediately friendly to Dorian, BUT it seemed less because he had captured her, which led to the death of her friend, while she watched, and more because of that single act of violence. He gave her NO reason not to believe everything she had been brought up to believe, and yet she just faded into the background as Echo surged forward. She didn’t try and stop her friend, or even escape and go back home – where she certainly would have been welcome! 1.How did you engage? I was a little confused at first by ‘The Ala’, was it a person/Avicen or something completely different. Why did her name include ‘The’ at the front? I’m still unsure however, once I overcame the fantasy world and was able to better understand the world of the Avicen and appreciate the novel for what it was, a work of YA fiction which needed to create the love interests, the friendships and the fantasy to connect to it’s target audience. 2 & 3. Convincing characters and motivations- I completely agree about the relationship between Echo and Caius. It also seemed that the author threw in the plot twist of Echo being connected to Rose to justify the relationship and make the age difference OK to the readers. I didn’t really buy in to it.. I also agree that the descriptions of Caius lacked lustre. She also didn’t mourn her first ever big relationship with Rowan, when you’re a teenager the break up with your first boyfriend is a pretty big deal but I guess like many of the big events they were glossed over due to no time to explore them further. Given all that did Echo really need a love interest for this story to work? Dorian’s motivation seemed the most developed. Many backstories for the characters were missing so it was hard for me to decipher what lead the characters to do what they did. Dorians was easy (because it was constantly repeated). He loved Cauis his ruler and his friend and stuck with him no matter what, even if it meant abandoning his way of life and position in society for him. This motivation is nothing new but it works well because it happens and can be relatable to readers. One thing I did enjoy about the characters was the symbolism which was expressed in their feathers, from Ivy to Jasper they each gave the reader something and added to the story and the mythical world created by the author. For example Ivy was a healer and a peaceful character and therefore her feathers were white, usually a symbol for purity. Whereas Jasper is described as having “smooth short hair-feathers were waves of purple, green, and blue. Jasper was a peacock through and through.” These striking colours are certainly a symbol for the devious and strong willed characters. We see these darker colours often being used in villains (e.g. the evil step mothers in Disney are usually seen wearing purple). 4. The plot- I’m kind of undecided about the plot because I feel that being a YA novel it isn’t a genre I usually read so I’m only comparing it to other genres. It was very fast paced but also left room for more (enter the sequel). 5. The author- I felt like the Avicen and Darkharin people were so similar to human beings that other than their ability to travel instantly, life expectancy and their looks they were the same. Did you want to inject more fantasy in to their worlds or were you trying to make a point? I was also really creeped out by the stillborn foetus’ in jars at the Agora, why? Just why? 6. Quotes- there really was some great little quotes within the novel, one of the most powerful quotes for me was “one cannot have light without darkness to temper it.” I think that it’s something that rings true in our world and will forever more, if you don’t have the bad people how do you tell who the good ones are? Not saying we shouldn’t be striving for a better world, but how do you know it’s better without the evil to measure up to? 7. The ending- I felt that the whole idea of Echo becoming the fire bird was very predictable. But I feel that anyone could have been the Firebird who stumbled across those clues and went through the door before her. I didn’t feel she was destined to be the firebird, it was just convenient because she was the main character. I don’t think I enjoyed the book enough to read the second one. I don’t tend to read many series as I find the other books aren’t as captivating as the first. There are of course a few exceptions to this, this book wasn’t one of them. Thanks for sharing your thoughts Teagan! I’m so glad you mentioned Dorian’s back story. I definitely agree with you that although he was actually a side character I felt like he had the most depth and the most easy-to understand motivations. I actually really liked him as a character and I felt like his struggles made for the most interesting development. He was mostly a good person, but sometimes he did bad things (like hit Ivy). Which he felt bad about and tried to atone for. I liked also that she didn’t just forgive him instantly, because something like that is hard to move past. In any other novel I would have expected he and Ivy to end up together and I would have had a huge problem with that, but as it stands that they formed a understanding that they could work together was one of the more mature relationship developments in the book. I also really agree with your comments about the Avicen, aside from their symbolic feathers I don’t really know much about their society at all. This series is often compared (for very good reason, they are very similar) to The Daughter of Smoke and Bone trilogy, and I felt the first book in that series did a far better job of hinting at the complexities of two warring races of fantasy beings. Of the two societies in this book I definitely felt I knew more about the Darkharin by the end of the book, and I quite liked them as an interesting society. But we saw so little of them and because of the structure of the book what we do know mostly came through chunks of dialogue which is a very clunky way to world-build. The ending! Yes, I hadn’t quite thought about it that way but, now that you mention it, Echo wasn’t “destined” to be the vessel, she just happened to find that music box. Or maybe her being destined was what drove her to find the music box? There could have been more development to that piece of the story, given that it pretty much unchained everything else. I usually need some time to get into a book and assess whether I’m interested or not. With this book, the prologue had me already hooked. It gave me a vibe of Neverwhere, which I loved. The whole setting in the library and that quote about books being like friends, wrapped in paper and scrawled in ink, had me thinking that I was in for an amazing story and that I would enjoy it immensely. Sadly, it was not the case. After the story kicked off (or should have) it got somewhat confusing. Echo found the music box and right after, there was a lot of talk about a war between the Avicen and the Drakharin and how it had claimed so many lives and no one even knew what had started it in the first place, etc etc, but I never got the feeling that there was actually a war going on. It felt like being told there are people starving while being part of a food festival – you know it’s true, and it’s happening somewhere, but not here. Given that the whole story should focus on said war between Avicen and Drakharin and how Echo is the one with the power to end it all, not having felt the war was not a good sign. The only moment it felt like war came after about 300 pages (at last!) and that, too, felt quite out of place. Out of nowhere Avicen and Drakharin were going at each other, and then? Echo &co. were hanging out in Jasper’s loft, plus the Ala. What happened? How did they get out of that fight in the Black Forest? It came and went so quickly that I had no time to process what was going on. The whole thing felt rushed and while I finally got a glimpse of the war I had been expecting for 300 pages, it was not enough. From the get go, I really liked Echo. Her sassy attitude, the fact that she reads (and I really liked that detail of her collecting words,) her loyalty to the Ala and the Avicen, and her humor. That being said, that feeling started to fade away, especially by the time Caius shows up. I rolled my eyes so much at their scenes that I feared my eyes would fall out. I tried to convince myself that Echo was a 17 year old girl and being hormonal (and horny) are part of the description, and then comes this handsome (because, did you miss those 1000 statements about just how handsome he is?) old (over 200 years old!!!) and mysterious guy and, of course, what is a 17 year old ought to do but to develop an instant crush? But, still, even that rationale didn’t help Echo’s case. Besides, I couldn’t even make that case for Caius. The guy is over 200 years old and also develops a crush in a 17 year old girl. Sorry, but no. That is just gross. I believed Caius’ well intentions, although it was hard to reconcile with his first scene, where the two Avicen were being tortured. Even good men have to do things they’re not proud of, I told myself, especially in times of war. Which kept bringing me to my eternal question: which war?! Nonetheless, the whole Echo-Caius thing didn’t work for me and while I liked him as the benevolent Dragon Prince who is trying to end a war that has claimed so many lives (or so they say,) by the end of the day the word “pervert” kept flashing before my eyes. Like I said, one of the characteristics I liked the most about Echo was her loyalty to the Avicen, and how her motivation to go through with this whole thing was to finally belong. As a 17 year old girl who had suffered from a horrible childhood with her parents, I could understand and believe her need to belong to her new found family. The scenes in which her being part of the Avicen gets questioned, I believed her pain, and understood her drive to keep going, to prove herself worthy. What does a kid want more than to feel welcome and part of something, be it a family, a community? However, and here comes the romance part again (which by now it should be clear I didn’t like,) she goes from being deeply in love and amazed and thrown off her feet by Rowan to be all that in Caius in, what, 3/4 days? She had a crush on Rowan since she was 12 but it was all forgotten by the kiss and the hormones and the feel of Caius skin? Here, again, I tried to defend her – she had just gone through the traumatic experience of having killed someone. Still, I felt like shaking her senseless. The Ala. I really wanted to like her, but I never understood much of her deal, other than being a sort of Sensei for Echo and having pretty much adopted her. It’s not that I disliked her, but I would have loved to have more of her, to have understood her better. Dorian was probably my favorite character, and while Caius and Echo’s relationship didn’t appeal to me, Dorian and Jasper’s did. I highly enjoyed seeing Jasper play with Dorian’s head, and I hope that Dorian does not end up breaking Jasper’s heart, now that he realized his heart can suffer from that thing called love. As for the quotes, I have quite a few. I will get to them later when I get my hands back on the book. Completely agree with what you said about the war Tati, I must say I completely overlooked that factor! I’m with you both about the war! It felt surreal, as though it was more of a ‘Cold War’ rather than an active conflict, but then it totally blew up for a few pages at the end?! And then they were back at Jasper’s?! It was really disjointed. Your ‘pervert’ sign made me laugh! I could not agree more. WHY does this keep getting written into YA?! And why is everyone ok with it?! I did have hopes for Caius as the exhausted and pragmatic leader vs his war mongering sister (nice sibling dynamic there), but the romance angle just killed all my enthusiasm for the story. 1. How did you experience the book? I loved the prologue when Echo was a kid in the library, meeting the Ala. Bit the first few pages of Echo as a 17 year old I found a little silly. A street savvy thief who always gets away. Just seemed cliche to me. But then I liked the interaction with the Ala and became engaged. 3. What motivates the main characters’ actions? Do you think those actions are justified or ethical? Echo wants to belong, and that is a good reason to do dangerous things in this story. She loves the Ala.
Caius wants to stop his sister, because yeah she’s a heartless warmonger. 4. Did you think the plot was well developed and believable? Did plot events unfold naturally? I don’t fully understand why the Drakharin hate the Avicen and why humans don’t notice wars going on between mythical creatures. How can they hide their history of war? How does the moment Echo steals the music box coincide with Caius being overthrown? I don’t understand the timing. Objects guiding her to the next object seemed too convenient. 5. If you could ask the author a question, what would you ask? Why did the Ala have a “the” but no one else did? 6. Did you have a favourite quote that you liked best? What made it stand out? While I didn’t understand how long Ivy was imprisoned, I liked that mental stability was addressed, when dealing with such a dire situation. It felt real. I would question my sanity too! 7. Did you find the ending satisfying? If so, why? If not, why not…and how would you change it? And will you be continuing with the series? Ivy and Dorian were the standouts for me too, I kind of wish they had been the protagonists! You also make a great point about Echo being really inconsistent. At the start she seems like a cocky brat, then a simpering lovestruck teen, then suddenly mature strategist falling for a super old dude. It makes no sense for Caius to implicitly trust Echo, someone less than a 10th of his age, and a human to boot. And if we accept that he trusted her because of Rose’s spirit inside her then Echo had no power/control over her destiny at all the the story becomes pointless.